Tina and Patrick first met on their first day of freshmen year of high school back in 2003. They became very close friends, but didn't start dating until after Pat graduated college in 2011. They have been together for 5 years as of August 4th.Their first official date consisted of dinner at Whiskey Island followed by West Side Story at Playhouse Square. To propose, he put together a short video "trailer" of how they met in high school using inside jokes and her obsession with Princess Jasmine. He managed to lure her into the Studio Theater at Beck Center for the Arts, where he has worked for 3 years, and he had projected the trailer onto a large screen. Since movies are a huge part of her life, she quotes her favorites daily, the theater setting was simply put, perfect! They tied the knot on June 3rd, 2017. They were married at St. Raphael's Church in Bay Village, Ohio. Their reception was located at Ariel International Center in Cleveland, Ohio. In between the ceremony and the reception, we went to Edgewater Park to take bridal party photos, as well as the portraits of the newlyweds. 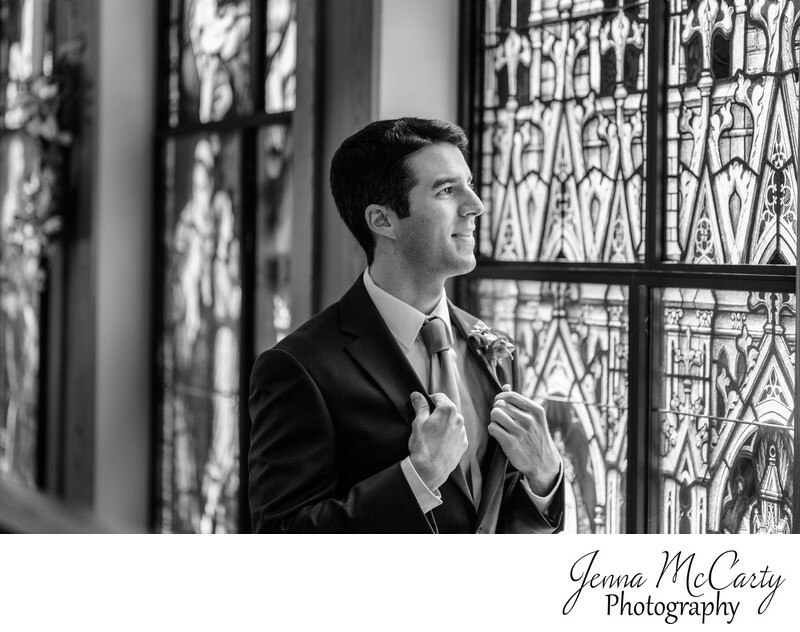 This photo features the groom in a groom portrait. He is looking out the gorgeous stained glass at St Raphaels Church in Bay Village, Ohio. Location: 525 Dover Center Rd, Bay Village, OH 44140.